Plump, peanut-shaped pond scum may sound gross, but it won the Australia-born scientist Elizabeth Blackburn the Nobel Prize for Physiology or Medicine in 2009. In her new book, The Telomere Effect, she says she devoted more than 30 years of her career to studying that scum, called the tetrahymena, because she wanted to understand what telomeres were made of. Telomeres (pronounced tee-lo-meres) are the tail ends of twisty DNA strands in the cells of every living thing, with DNA being shorthand for deoxyribonucleic acid, from which genes are made. Think of DNA as shoelaces, she says, and telomeres as anglets, or the tiny plastic tips that keep the laces from fraying. Like most materials, telomeres tend to wear down by shortening and, whenever they do, that living thing ages. That is because shortened telomeres cannot protect a body's cells properly, leaving the cells unable to replenish themselves. Such cells will then start signalling for help from other cells in the body. Worst of all, she warns in luminous prose, shortened telomeres become so preoccupied with protecting themselves that even when their wonky cells signal wildly for help, the damaged telomeres will not let helpful cells in to repair the damage, much like "people who doggedly refuse assistance in the face of adversity because they're afraid to let their guard down". Thus the damaged cell becomes "like the rotten apple in the barrel" by affecting all the tissues around it. This is known as chronic inflammation, which some doctors now call "inflam-ageing" because of how badly it wrecks the body. Blackburn's breakthrough, then, was in proving that a person's poor responses to severe, sustained stress directly shortens telomeres, making a body age faster than it should. She is the first scientist to show that toxic thinking can kill. As she stresses throughout the book: "Your cells are listening to your thoughts." Such seeping poison comes, for example, from friends who constantly misunderstand you; a spouse whose persistent gloom colours everyday life; and racist slurs. Her study of women caring for their sick children versus women with healthy children has also shown that parents with shorter telomeres can pass these on to their children. 1 Why and how must you be kinder to yourself than ever? 2 What are the three greatest enemies in your bid to age well? 3 How much stress is too much? 4 What can you do immediately to live longer? 5 Why and how might parents best engage with their children today? The good news, however, is that everyone can lengthen his telomeres again and slow down or even reverse ageing through exercise, eating well and sparingly, and fending off all threats and fears - especially the fear of growing old and sick - by meditating and keeping an upbeat mindset. Thanks to her work with pond scum, Blackburn cracked the secret to staying younger or, as she says, keeping your "healthspan" longer than your "diseasespan". For starters, eschew processed food such as cold cuts and soft drinks. Also, sweat it out at least 45 minutes a day, three times a week, because that will give you telomeres as long as that of a marathon runner. But do not sweat the small stuff and do sleep for at least eight hours a day. Telomeres are sensitive to your surroundings, so try to live in leafy, not littered, neighbourhoods and use as few chemicals as possible. Blackburn, who is president of the Salk Institute for Biological Studies in California, partnered American health psychologist Elissa Epel, who focuses on ways to reduce stress, to write the book. This was because they did not want anyone else to distort Blackburn's discovery by writing poorly understood articles or peddling products with stay-youthful claims citing her research. Can you stop or reverse ageing? 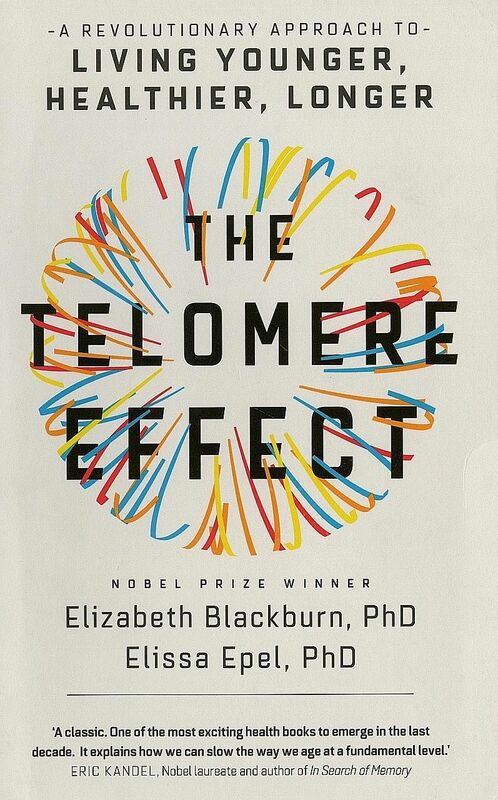 As a follow-up to mental health doyen Kua Ee Heok's over-subscribed Big Read Meet on ageing well last month , this month's Meet will discuss The Telomere Effect, written by 2009 Nobel Medicine Prize winner Elizabeth Blackburn and her friend, American health psychologist Elissa Epel. Blackburn is president of the prestigious Salk Institute in San Diego, California, while Dr Epel works at the University of California in San Francisco. Join senior writer Cheong Suk-Wai to talk about their ground-breaking studies on how to arrest, or even reverse, ageing on Oct 25 from 6.30pm. As the Meet's pool of readers continues to grow, it will be held at the more spacious Programme Zone in the Central Public Library, Basement 1 National Library Board headquarters, 100 Victoria Street. Sign up for it at any NLB e-Kiosk or go to http://www.nlb.gov.sg/ golibrary and look for "The Big Read Meet". That is already happening, with enterprising sorts promising ways to boost the body's telomerase (pronounced tell-o-mer-ace), the enzyme that coats and protects telomeres. But as with everything else that matters in life, there are no shortcuts to slowing down ageing. Blackburn warns that any attempt to increase your levels of telomerase will likely put you at much greater risk of having brain tumours, melanomas or, even if you have never smoked, lung cancer. What a world away all that is from 1975 when, using dishwashing liquid, salts and glass jars full of millions of tetrahymena, Blackburn managed to isolate this single-celled pond scum's DNA from the rest of its cell. Science, she stresses, is about teamwork and so her colleagues Carol W. Greider and Jack W. Szostak won the Nobel Prize alongside her for building on her research. She admits at the end of the book she has had the length of her telomeres tested. The result? "Reassuringly good," she says. Epel, however, will not yet submit to the commercially available test, which costs between US$100 (S$136) and US$500, because she is not sure of how useful the results are. As Blackburn herself told the Guardian writer Zoe Corbyn in January: "I see no harm in it, but it doesn't mean a whole lot. You can be long one year and short another year." It is highly likely that readers would already have had hunches, or kitchen-table wisdom, about everything that authors Elizabeth Blackburn and Elissa Epel say cause a person to age badly and speedily. Nevertheless, their book is essential reading because it is among the first to present solid evidence of such hunches and inherited lessons - and all in one spot. Better yet, they reinforce key findings with clear and easy-to-grasp diagrams and charts, as well as succinct bullet points at the end of each chapter. Add to that their many handy checklists for mental health, from testing how much stress you absorbed in childhood to what the rhythm of your daily life is like, and you have a veritable divining rod for the best possible living. This book tells you a great deal about how to stay younger indefinitely, which in theory boosts the quality of life. Its authors are less forthcoming about why exactly such long-life practices reverse ageing effectively. To that extent, about two-thirds of The Telomere Effect reads like a reliable self-help book, with a further 60 pages or so of notes on sources. The rub about this book's how-tos is that there is precious little that everyone does not already know about staying young, including qigong, yoga, meditation, the Mediterranean Diet and getting more sleep. The devil is in the doing, not telling, of all these prescriptions and Blackburn and Epel's careful writing would not immediately inspire anyone to spring out of their chairs and embrace exercise.